Took the train up to the Elmira Maple Syrup festival this morning. The Waterloo Central Railway is run by volunteers and is always a joy to ride. Lots of kids on it. We returned on the #21, the new bus from Elmira to St. Jacobs, to the market, to Walmart and then to Conestoga Mall. It was quicker than driving because it went around the Syrup festival traffic jam. Perhaps I should say the “infamous” 21 bus as a column in the Record this morning called it a “political” and “social” bus, whatever that means. The bus has been extended for a year because it is showing growth in passengers. The social bus idea, I just don’t get. A social service because people without cars ride on it? The Route 21 pilot service to Elmira began operation on April 6th 2009. 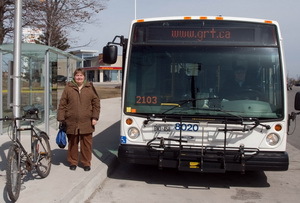 This service connects Elmira with the Conestoga Mall transit terminal, including stops in the St. Jacobs’ core, at the St. Jacobs Farmer’s Market/Outlet Mall and the new Wal-Mart Centre. Overall, the route is demonstrating positive ridership trends as the average weekday ridership has risen from 158 riders in April to almost 315 riders in December. There was some decrease in weekday ridership during the summer months, which is traditionally the case for transit ridership across the system. Market day ridership on Saturdays has risen from approximately 270 in April to 585 December. Ridership continues to increase on Route 21 ELMIRA and the boardings per service hour have increased to 21 in December 2009 and continue to move towards the minimum performance target of 25. Based on experience with new routes in urban areas, a one-year trial period may be insufficient to evaluate fully a routes ridership potential. It can be expected that a new route to a rural township would also require more than a year to achieve its ridership potential. Therefore, it is recommended that the pilot service continue in operation for one additional year until early 2011. Positive feedback from high school and university students, commuters and seniors, who have used the service, suggests that it provides residents of the Township of Woolwich a valuable transportation alternative. Planned outreach events will increase community awareness and confidence in using the service, which will contribute to ongoing increases in ridership. This entry was posted in Regional Councillor Jane Mitchell\'s Blog and tagged Bus, Bus 21, Elmira Maple Syrup Festival. Bookmark the permalink. I rode the 21 to and from Elmira today. It was great! It seemed to be pretty popular, especially on the way back. Judging from the number of riders who paid using cash, it was attracting a contingent that might not typically ride transit. I was glad to see route 21 being promoted on the festival web site too. As for the article in the Record, any reasonable transit system should offer connections to major outlying communities. If bus service to Elmira had been introduced ten years ago — as I believe it should have — I’m sure it would be even more popular than it is now. These things take time to develop. Just to give an example, I come from Sooke, a town of approximately the same population as Elmira, near Victoria BC. The local transit agency has operated service between Victoria and Sooke for decades. I rode the bus when I was growing up, first with my parents, and then by myself. I even rode it to and from school for a couple of years. It was great. Even though Sooke is much farther away from Victoria than Elmira is from Waterloo, this bus route was carrying 37% of commuter trips in 2001! Here’s a report with a bit more info (section 3.1.5), if you’re interested. With rising gas prices and more environmental awareness, I am sure that the proportion of trips on transit has increased in the past ten years. The number today may well be over 40%. Even though I live in the city and deal with overcrowded buses on busy routes, I fully support the provision of transit to Elmira. (And Breslau! Any plans for that?) I’m not sure what credibility the author of the article in the Record thinks he has, as he himself has admitted that he doesn’t even ride the bus. I get the feeling that he enjoys complaining about any transit expenditure.